St Paul is quite possibly the most unusual church in the city. It sits in the heart of the maze of streets of the vast Hellesdon housing estate, and if you did not know what to look for you would not come across it by accident. 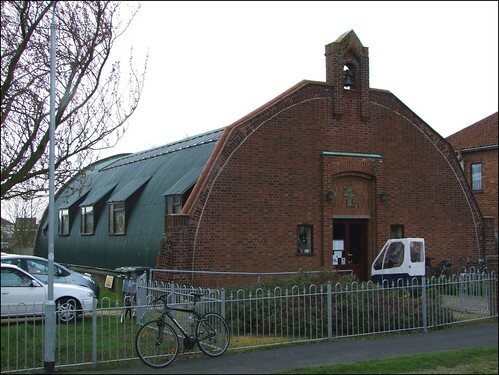 The frontage is an elegant seven-edged red brick semi-circle, but it is only when you go behind this that you see the facade has been added to a dark green corrugated iron nissen hut. I hadn't really expected that it would be possible to see inside, but I need not have worried. A senior citizens coffee morning was on, and they seemed to be having a whale of a time. The man in charge was very happy for me to go inside and take a look. Most of the chairs were stacked up in the little chancel, and the cheerful bunch, about fifty or so of them I should think, were sitting around tables in the nave. There was a certain amount of jolly banter when people saw my camera, and one lady expressed her disappointment when I said I was taking a photograph of the building rather than of her. In fact, what really drew my eye and my camera was the feature which is the highlight of St Paul, apart from the people of course. This is the 1950s window by the William Morris workshop of Westminster. It depicts the Risen Christ in Glory. In all honesty, it is by no means the best post-war window in Norfolk, but it stands out in this humble place as an adornment and an act of witness. The ladies I spoke to certainly seemed to like it. I expect that St Paul's dedication is a result of the destruction of the medieval St Paul in the Norwich blitz in 1942. It is a chapel of ease to the medieval church of St Mary, which is set away from the hubbub of Hellesdon in the old village beyond the Drayton Road, more than a mile away. I imagine that it would be possible to live here and not even know that the mother church existed.